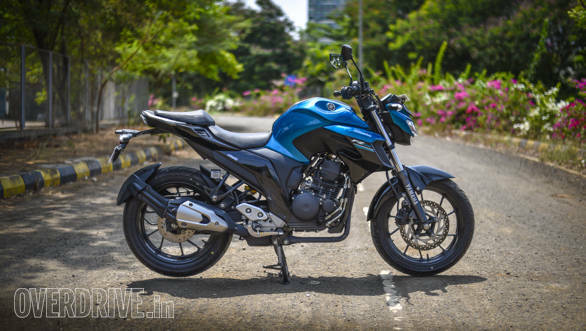 The Yamaha FZ25 arrived with a great price and when we tested Yamaha's new 250, we liked the mild-mannered but extremely well-made FZ25. 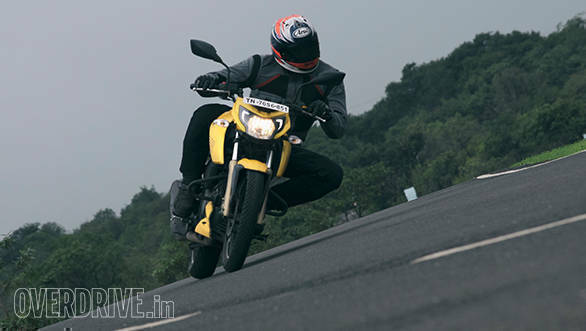 But it enters a field with a modest specification which is likeable but it opens the Yamaha FZ25 to attack. 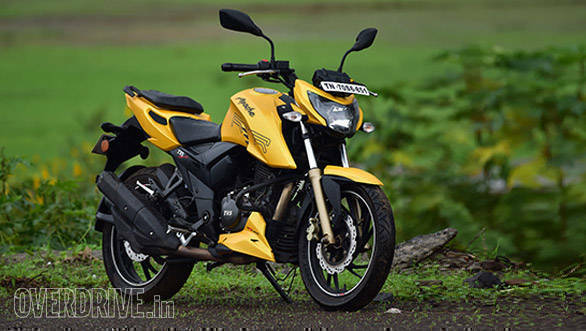 To wit, the TVS Apache RTR 200 4v might trade in 50cc but it's got very similar specs and a very agile character. 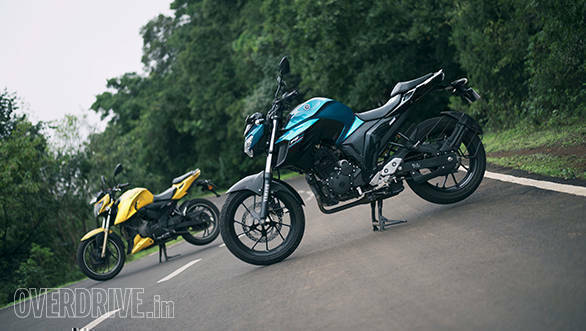 Given that the prices of the Yamaha FZ25 and the TVS Apache RTR 200 4v are so close together, a comparison was due. Well, let's not hang around. Yamaha has an amazing record on the build quality front in India. The FZ25 carries the mantle very well. It feels well made, all the parts fit just so and you never sense that in time, stuff will come loose or rattle. And TVS is at the forefront when it comes to precisely the same thing among the Indian companies too. And again, the RTR is no slouch. It feels as wel made as the Yamaha and just as likely to last a long time without rattling or squeaking. Perhaps the difference is in the details - both motorcycles have small things that look like someone paid attention - the TVS' headlight unit and meters and the Yamahas headlight beam design and the radiator shroud for example. The point is that at least on quality and finish front, they're even. Design is a more involved thing. The RTR looks fresh and headlight aside, it is clearly an evolution of the older Apache's design tenets. It looks good too. The new headlight is fresh and distinctive and the twin DRLs - shortly to be irrelevant as a thing in the automatic headlight on world - at the top and side of the beam looks good. I wish the exhaust looks smaller and a bit more conventional bout overall, the musculature, the proportions as well as presence, the TVS has in spades. The Yamaha doesn't roll over and play dead either. The lines are clearly evolved from the sculpted FZ and the small all-LED headlight is a distinctive element. In fact, the powerful shape of the radiator shroud/tank extensions and the small beam make the motorcycle look extra muscly. I do with, again, that Yamaha had lightened the visuals of the bodywork from the swingarm pivot to the tail which are a bit bulky. I also think that the exhaust should have swept further upwards - it's very broad and I repeatedly caught my foot under it when taking off from a standing start. Here's the juicy part. The Yamaha uses a bigger 249cc engine and the TVS has a 198cc engine. Both share nearly identical compression ratios and make 21PS of peak power (there is a difference of 0.1PS which disappears when you round it off). They're even identical in weight - both kerb weights are 148kg. How do you think the numbers look? Actually they're not identical. You see the Yamaha employs its extra cubes to make torque. Its 20Nm is about 2Nm more than the Apache's peak torque. Both peaks for the Yamaha are lower in the revs too. And it shows. The Yamaha FZ25 - not that you would ever guess from how it feels to ride - is a full 2 seconds quicker to 100kmph. 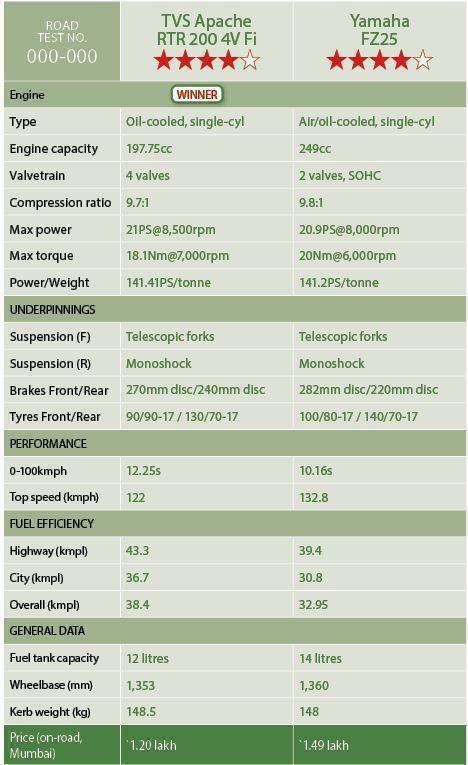 The light weight also brings the FZ within half a second of the 100kmph time for the 24PS Bajaj RS200, the Pulsar happens to be a much heavier machine. But set aside the numerics for a moment. 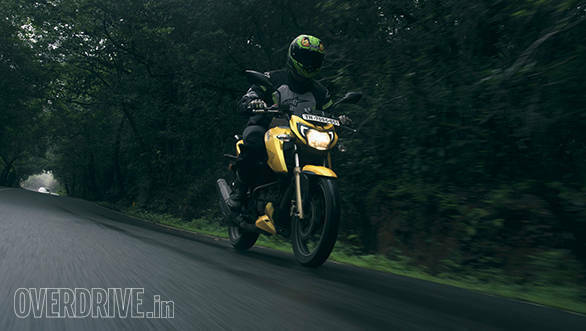 The 4-valve RTR 200 was designed to be the consummate city bike while the FZ25 was designed to be, you guessed it, the consummate city bike. Both are good fun. The Yamaha is the quieter one of the two and it's a sweetheart. You can run very high gears at stupidly low speeds and it never feels the strain or lugs. The TVS isn't quite that easy but it's firmly in the same ball park. But the noise from the exhaust and a generally more upbeat temperament means that the TVS feels quite a bit more involving than the Yamaha. On the flip side, both have five-speed gearboxes and you miss a sixth cog out on the highway on both. Neither machine can cruise too far past the 100kmph mark without buzzing the fingers and you're constantly searching for a shift up into sixth. In terms of economy, there's the TVS, at 38.4kmpl is about 5.5kmpl more efficient overall, but I wouldn't base a purchase decision on a difference that small to be honest. There is where these two well-matched machines finally show some differences. First, the ride quality. Both the TVS and the Yamaha are well suspended though neither is plush or soft. The Yamaha is just a small bit smoother in feel and that's perhaps the little edge it has on the comfort front. But in the corners they're very different. 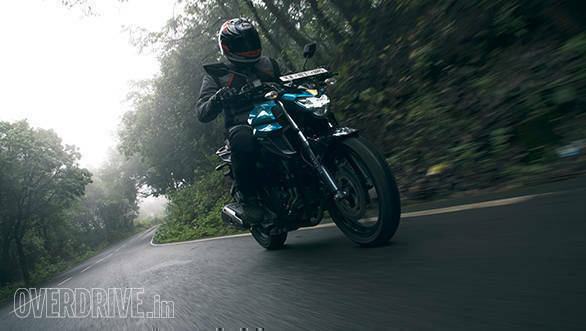 The Yamaha's front- and rear-ends are better matched and this gives the FZ25 the calm neutrality that only the Japanese seem to be able to deploy at will. So the FZ turns in well, is easy to sit on at high lean angles if you need to and the easy torque means driving out of the corner is easy. It is also flickable enough in the city and that means negotiating traffic isn't a challenge at all. The TVS is vastly more involving. 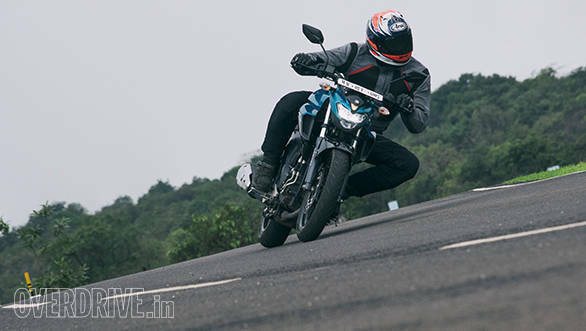 If you jump off the FZ and on the RTR, you get the sense that the front-end turns in sharper than the Yamaha. But once you get used to the TVS' feel you realise that it isn't just the front-end. The TVS reacts quickly and constantly to inputs. This makes getting through traffic swift and busy and it makes hard cornering very thrilling if you're in the right mind. As Rishabh found out at the TVS race school, at the track, it also makes the RTR a good bike to learn on because it doesn't smooth out your errors and forces you to apply yourself. Part of the reason is the smaller wheelbase of the TVS plus the narrower, but gripper (Pirelli) tyres. On the brakes, the Yamaha's slightly sharper and offers more feel but the TVS isn't very far behind either. This is where the cost-cutting on the Yamaha is, unfortunately, hard to hide. The digital meters, for example, are the simplest I've seen in a while. 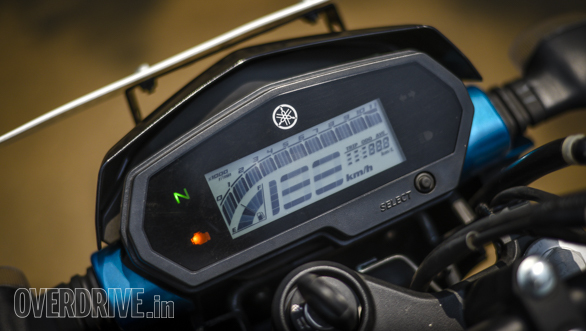 The TVS crams it in, shift light, top speed readback, clock, gear indicator... 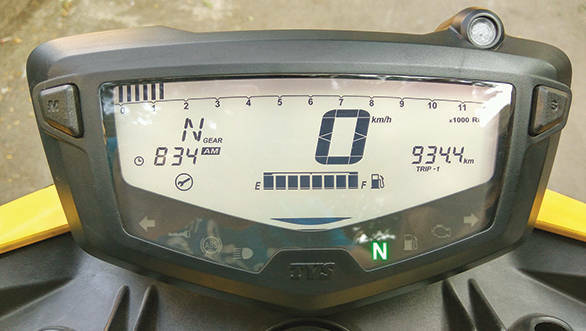 The Yamaha has almost nothing to boast about on this count, not even individual left and right indicator indicators. The Yamaha does have an LED headlight, though. And sadly, neither bike gets either ABS or radial tyres. These are two closely-matched, extremely likeable machines. And neither is perfect. Both would have been served well with a taller sixth gear for highway work and I would have loved to see ABS as standard equipment as well. The Rs 1.49 lakh (on-road Mumbai) Yamaha is a small bit easier to ride in the city because you make fewer gear changes. The headlight is powerful and this is, generally a comfortable machine. I do wish Yamaha had given the FZ25 some more teeth though. Something to make the ride experience a little more involving. It's solidly made and as an upgrade to the FZ16 it works rather well by offering small increments in ability or equipment at every level. I do wish Yamaha would inject some of the flair the brand is known for in to its commuters. It would underline just how good their machines always, always are. 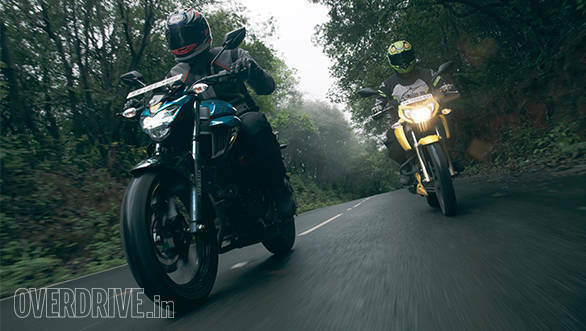 But if you want more involvement and that sense of a motorcycle that's actively participating in your ride, then the TVS Apache RTR 200 4v has the edge. It's nearly as good as the Yamaha in city and certainly a lot more fun in the corners. It produces better economy and only marginally slower acceleration. At Rs 1.20 lakh (on-road Mumbai with Pirelli tyres, fuel injection and no ABS) it also happens to be Rs 29,000 cheaper than the Yamaha. But it's the involvement that seals it for me.